Rafa responds to Dubravka rumours after Juventus & Premier League giants show interest – NUFC blog – Newcastle United blog – NUFC Fixtures, News and Forum. 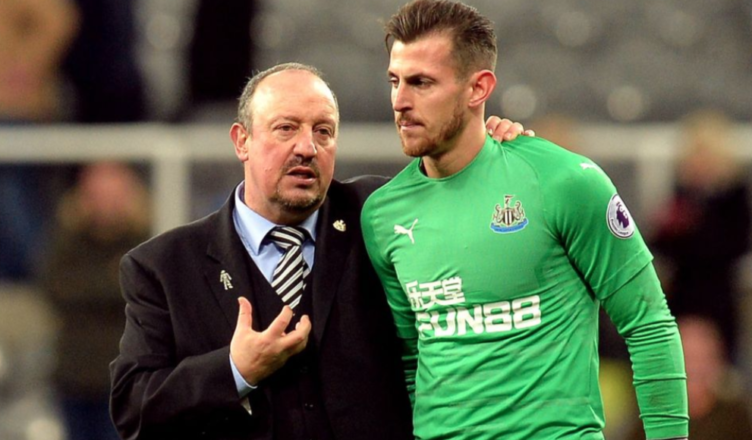 Rafa Benitez has insisted that Martin Dubravka is ‘fully concentrated on his job’ after claims that both Juventus and Arsenal have been watching the goalkeeper in recent months. Interest from Serie A giants Juventus has been reported for some time now, however the Chronicle did state over the weekend that Arsenal have also been watching the Slovakian this season. The same piece stated that Newcastle United were ‘calm’ about his future – with it reported recently that he’s keen to discuss a contract extension – although interest from two European giants is a slight concern. Dubravka really has been a revelation. Aside from the odd error, he’s barely put a foot wrong over the last year. Any mistakes stand out due to how infrequent they’ve been over the past season and a half, and that’s credit to him and shows just how faultless he’s been 99% of the time. He seems a brilliant professional, a calm and composed character – both on and off the pitch – and has shown what a well rounded goalkeeper he is; whether it be his reflexes, his ability to claim crosses, communicate from the back or come quickly off his line. Given Woodman’s future may lie elsewhere and both Darlow and Elliot are two considerable downgrades on Dubravka, let’s hope he sticks around for a while longer yet. With that kind of interest and the prospect for career growth and European football, It will be hard to see how NUCF will keep Dubravka at St. James.